Music Costs > How Much Does a Harpist Cost? 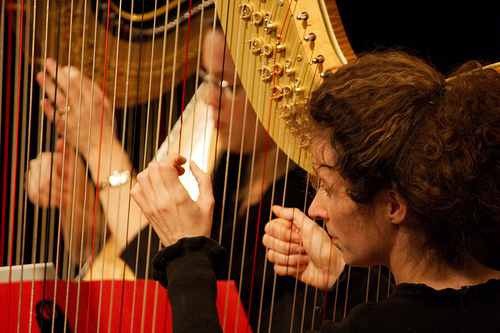 Harpists are skilled individuals who play and are knowledgeable with the harp. The cost of hiring the harpists differs based on several factors. These factors include the type of event the harpist will be hired for as well as the number of songs they will be required to play throughout the event. On average, a solo harpist will charge anywhere from $200 to $600 for the first hour and each hour after can be an additional $100 to $300. The cost will depend on the distance traveled, the experience of the harpist and the geographical location. Some may charge by the hour, while others will offer a flat fee for your event such as a wedding. The more harpists you add to the event, the less you will pay per hour for each one. For example, if you were to hire a trio, you may pay $475 per hour instead of $600. Most weddings will hire a harpist for one to two hours. Dawn Bishop, a professional harpist located in Chicago, charges $600 for one hour, $750 for two hours and $900 for three hours. Adding another harpist can increase the prices by 60 percent or so. What should be included in the fee? Most harpists will have a preset package you can choose from. Keep in mind that they won’t play the entire time that they are there and will take breaks every hour or so. Usually, they will discuss the breaks ahead of time and will try to do it during parts of the event that doesn’t require music. Most will play while the guests are being seated during the ceremony, during the entrance of the bride, during the signing of the register and as people exit the venue/outdoor area. The harpist will also be able to offer music during the drink reception. The harp can be moved from one room to another, but it will take up to 15 to 20 minutes to do so. During the consultation, the harpist will discuss your event, the music you would like to play and the cues they will be using. Many will arrive one to two hours ahead of time to set up, tune and test their harp. 99 percent of the professionals you will hire will bring their own equipment unless it’s discussed ahead of time. This will include the harp, a music stand, stool and the sheet music. Some, while optional, may amplify their sounds by bringing their own amplifier. This is often done if playing in front of a larger crowd. Before you hire a harpist, a reputable professional will offer a musical demo and/or may even have a video online showing you what they can do during your event. Overtime fees may apply if they go over the allotted times. If one is hired for a ceremony such as a wedding, an extra food plate may be needed. If the harpist has to travel outside of his/her vicinity, additional fees can apply for mileage. Usually, the first 20 to 30 miles will be free. Some harpists prefer to play indoors and may charge a premium to play outside. This can be an additional $50 to $150. Performances held on holidays or requiring travel which requires an overnight stay will cost more. If a vocalist needs to be present, additional fees may apply. Liability insurance, if your venue doesn’t include it, may be an additional cost to think about. Most harpists are going to have a sample available on their website that you can listen to. This will give you a good idea on what they are going to sound like before you even get in touch with them. A good harpist will have a great demo recording, professional photos, wonderful customer reviews, the right equipment and a reasonable cost. Be sure to know how far the harpist is going to travel before hiring them. What you’re going to find is that some may charge a lot more money to travel outside of their vicinity. Be sure to ask for referrals from people that they have worked with in the past. Most are more than happy to give out referrals. Most professionals will ask for a 50 percent deposit before they secure your booking. The more room a harpist has, the more comfortable they will be. When planning your event, try to include as much space as possible. One way of saving on hiring a harpist is by going to different websites to check for prices of local harpists. Gigmasters.com, for example, provides a listing of available harpists in your area; the search is free. Try to talk with at least three to get a good idea on what they can do for you, and remember to focus on their quality of sound, not the price. Off-peak discounts may be available with some. Had one perform five songs at a local event here in California.